MARCH 7 – 11, 2018 : For VOLTA NY, 2018 Art Money is pleased to present Traveling Spaces, a group exhibition curated by the RE-SITED collaborative Melissa Bianca Amore & William Stover. The exhibition features works by artists Willem Besselink (Dutch, b. 1980), Caroline Cloutier (Canadian, b. 1985) Reinoud Oudshoorn (Dutch, b. 1953) and Ira Svobodová (Czech, b. 1986). “There are basically two kinds of spaces. One that you look into or enter only with consciousness and the other you enter physically”. What frames and navigates space when space itself is perpetually spinning? These artists through various mediums create a series of “interruptions in space,” whereby addressing ideas of “site” and “space” across painting, photography, sculpture and installation. 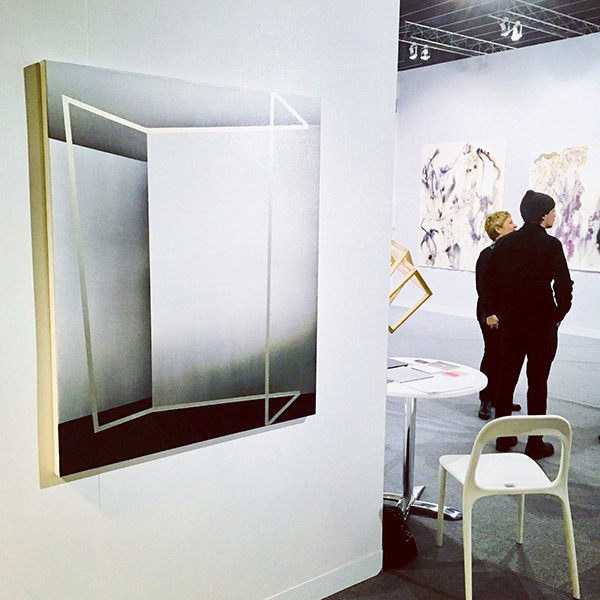 Each medium, in this instance, becomes a psychological and a physical “medium of site.” Attention is quietly drawn to the visual siteline that is activated across the Art Money booth, gesturing one singular form or line that folds and reforms across each medium, referencing the difference between the physicality of being in space and the act of looking at the rep- resentation of space. These artists extend and re ect the site through the process of imitation and repetition. They conceptually render the sense of observing “space” and “site,” as interchangeable ideas and modalities. Willem Besselink’s site interventions are a result of translating everyday patterns into a system of codes and a network of interconnected structures. For this exhibition Besselink has created a succession of serial lines, made from wood, that form a geometric wall cutting that reveals and inverts the existing architecture. The interlacing con gurations and points of intersection create new possibilities and a visual optical symmetry. “My work derives from a fascination with structures that are embedded within daily occurrences,” he says. “Structures that are invisible at any given point, but that repeat and become apparent in time.” Besselink extends and re ects the site, purely, through the process of imita- tion and the act of mimesis. Reinoud Oudshoorn’s optical arrangements combine the principles of architecture, painting and drawing into new spatial con gurations. Working primarily with iron and frosted glass, his works become inverted re ections that induce a type of perceptual ambiguity. Each intelligible structure activates and frames the site that it occupies, making the viewer re-examine the appearance and representation of space itself. These sculptures dissolve into an illusionary vanishing point and reveal the immaterial, becoming windows or portals into a space beyond the tangible. The concept of extending the site or space beyond the frame is also examined in Ira Svobodová’s paintings. Through the process of folding, the artist combines abstraction with architecture to examine the psychology and the material- ity of spatial orientation. These works spatialize space, and provide new ways of experiencing the object or rather, the painting of space. The sheer vastness and endless pleats envelop the spectator into a space of conceptual lines and architectural contours that are both imagined and observed. These artists provide a basis for questioning what we see, and how we begin to identify the very thing or object under observation. Each mechanism, whether a painting, sculpture or image, represents the multiplicity of appearances that form our understanding of reality.